Medicine Whoops társasjáték - Magyarország társasjáték keresője! A társasjáték érték! A Medicine Whoops egy kiváló társasjáték, 2 - 4 játékos részére. A társast, 10 éves kortól ajánljuk kipróbálni. A játékmenet erősen épít a pakli tervezés, a minta felismerés, a szimuláció, a kockadobás és a vedd el mechanizmusokra. 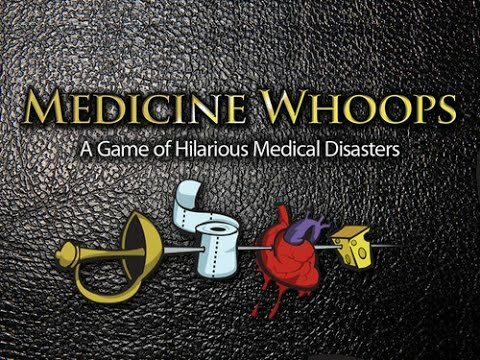 A game of hilarious medical disasters. Players each take on the role of doctors at a poorly supplied hospital. Doctors compete with each other to treat patients using whatever tools they are able to acquire. Players also have the ability to hinder their fellow doctors in the middle of surgery or just agree to play a round of golf while the patient expires. Patients will begin to stack up fast... both cured and killed. Add em up at the end to determine who among you is the best doctor under the worst conditions imaginable. Players start with a handful of tools which they quickly put to use when the first patient is revealed. Once the patient is flipped doctors must quickly determine if they can attempt the surgery using the tools they have in their hand. During surgery other doctors can attempt to hinder the procedure by playing whoops cards which can increase the cost of surgery or steal tools or patients right out from under you. The length of the game is variable depending on how many patients you want to attempt to treat. This is determined at the beginning of the game. After the last patient has been cured or killed the game is over and doctors count up their living patients subtract the ones in the morgue and arrive at a final score.